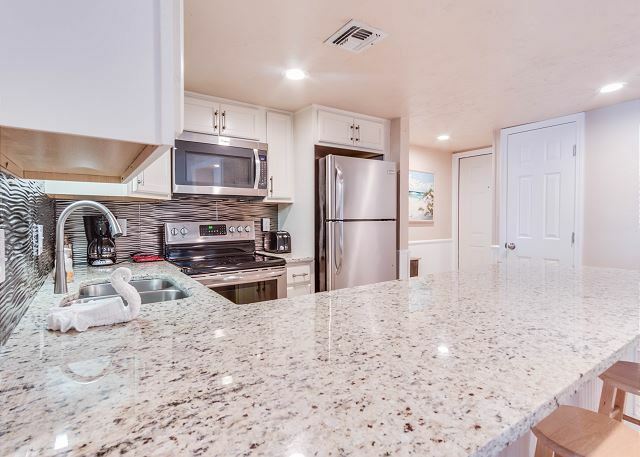 This 4th floor unit has recently been renovated and is sure to wow you! 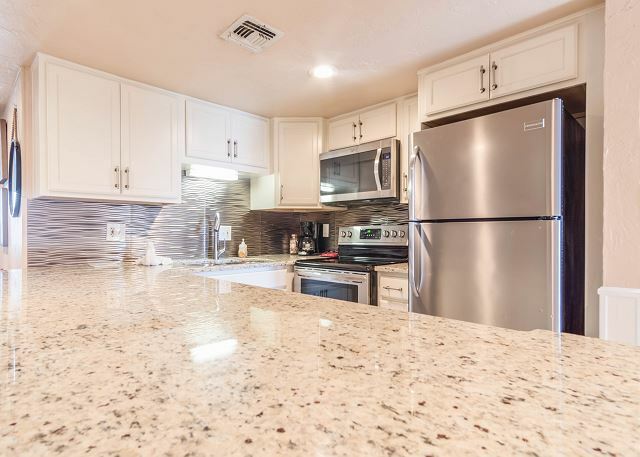 You will enjoy its updated features, such as; tasteful granite counter tops, a beautiful back splash and stainless steel appliances in the kitchen. New tile floors have been installed throughout the unit as well as all new furnishings. 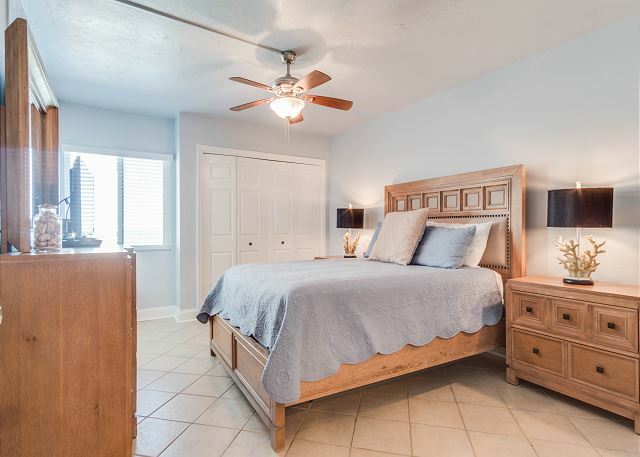 This condo accommodates up to 5 people with a queen bed in the master bedroom and two twin beds with a trundle bed in the guest bedroom. 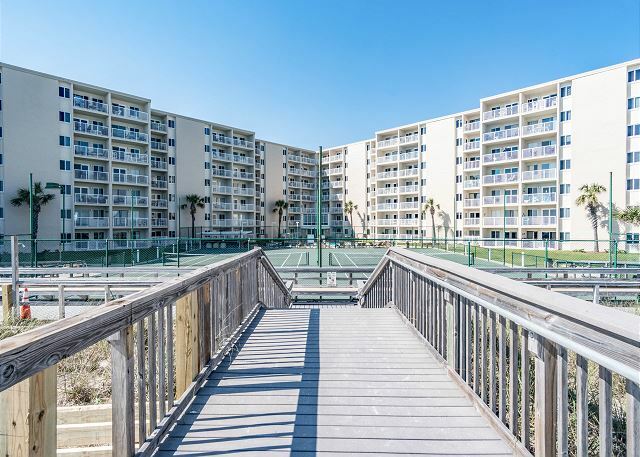 Enjoy the easy access to the beach and pool at this beach-front complex. Right down the road from the condominium awaits multiple shopping and dining experiences that will be sure to please you and your family. Spend your days taking in Florida's bright rays and salty air and return to your condo every evening with the complete 'at home' feeling. When your trip is over, you will be counting down the days till your return to Holiday Surf & Racquet! Just bring your swimsuit and flip flops, we have the rest covered! 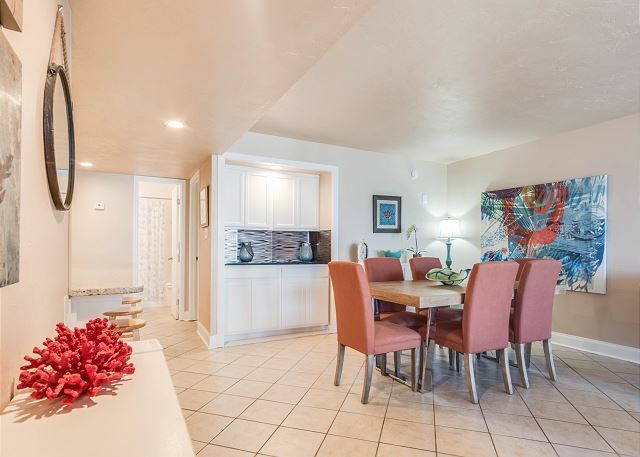 Rooms Sleeps 5, BEAUTIFUL 2 BEDROOM, 2 BATH CONDO IN DESTIN! 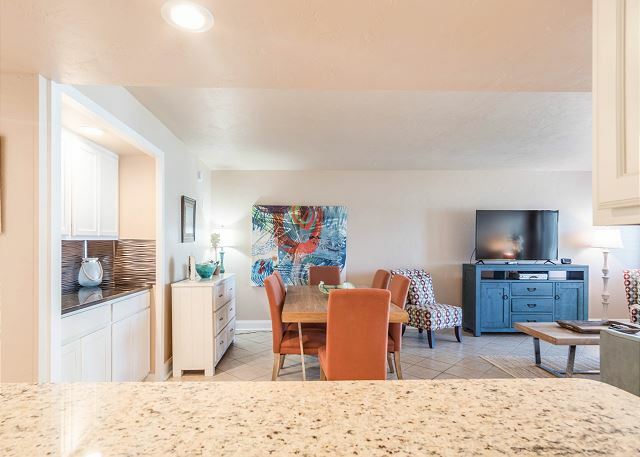 The condo was clean, comfortable, perfectly located, fairly well appointed. With a Target across the street, and the beach right outside your door, we had everything we needed! Would definitely book this place again!! Real nice last minute booking! 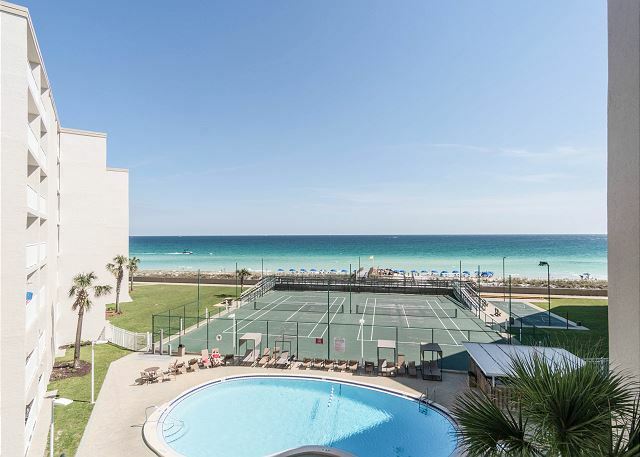 We decided to take a chance on finding a beachside condo on a recent week long trip to Destin. I was happy to once again work with the Blue Marlin gals to secure a condo. We had a great time at Holiday Surf. It was a real nice unit. Clean, quiet, convenient. Easy stroll to the beach. Many thanks to Presley st Blue Marlin for her help and friendly manner! Perfect in every way. Building has been recently renovated and unit is everything as described. Great place to vacation with a family. We had a great time. The condo was right on the beach. It was clean and had had everything needed for a family of 5. We will plan to stay at this location again. This was a great stay for us. We had 6, including a 2 year old, and we had plenty of space and privacy to enjoy the trip. The rental company brought us some chairs during our trip so we didnt have to rent the resorts. Great place and would recommend! We loved staying at Holiday Surf & Racket. Location was a plus. Off of the busy hwy and yet convenient to all the great restaurants and shopping. Would have liked to have had a King Bed in the Master, but we made do. Unit was clean, updated and fully furnished. Will definitely be back. The experience was great. Nice spacious rooms. We purchased groceries and cooked a few meals during the week we were there. It is right on the beach which is a plus. The only negative was a tropical storm brought rain and wind which closed the beach for a couple of days. This trip was scheduled specifically for preparation for our upcoming relocation. This unit was fully equip with everything we needed. Views were spectacular! Unit was clean and beautifully decorated. Would highly recommend! We love staying here. It's just perfect for families. Well appointed, convenient, beautiful! It was a great rental and a perfect vacation! 5 stars! We had a great time staying at the Holiday Surf. The other people staying were cordial and access to the beach was close. It is kid friendly. We even were given the option to check in early. We had a great time and would def return! From the moment we checked in with Monica at Blue Marlin, the fun began! 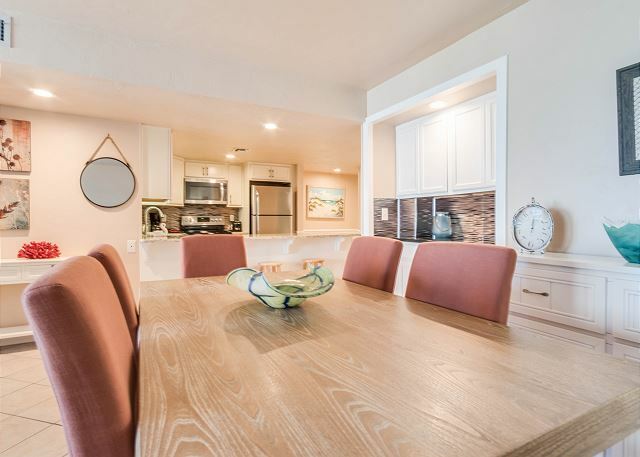 This condo is in a great location and the property is small so it's not overly crowded. The workout room was perfect! Just what you need on vacation to stay in shape. Our two year old loved it! Very kid friendly. The one draw back was the chair rental and linen exchange was not included in the rental from Blue Marlin. The condo has been recently renovated. Everything is like new. Their is a slight issue with the climate control... Seemed to stay damp all the time. The master bed is not the most comfy, either. Those very small issues were overshadowed by everything else! Our stay was very enjoyable. 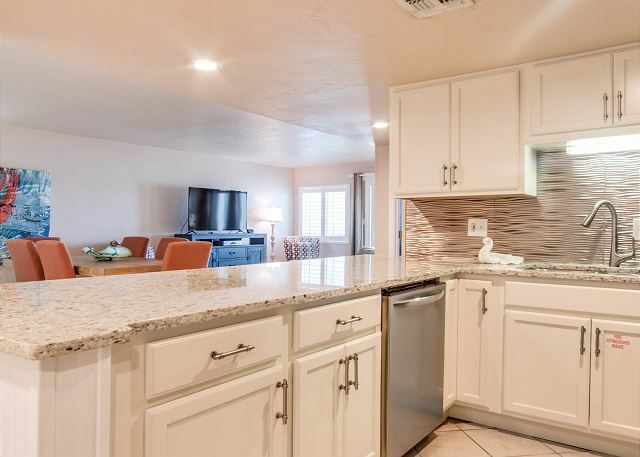 Our condo was very clean , the location was perfect , the view was awesome.. We enjoyed being right back the pool, the pool was heated everyday a few days were cold and windy but we were still able to use the pool. The kitchen was well stock but could use a few extra dish towels. We plan to stay again at Holiday Surf & Racquet condos. Loved staying here! The view from the balcony was great because I could see both my family members who decided to split up and do different activities. I could see the pool and the beach. 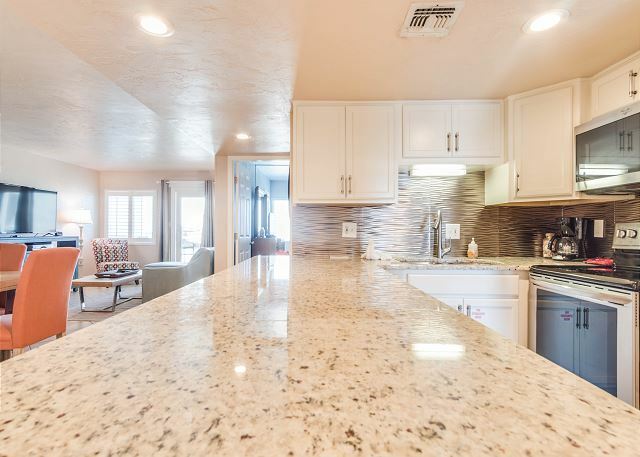 The only thing I would have wanted in the kitchen was a blender. But I realize that might be a little picky! This is perfect for families. Highly recommend!